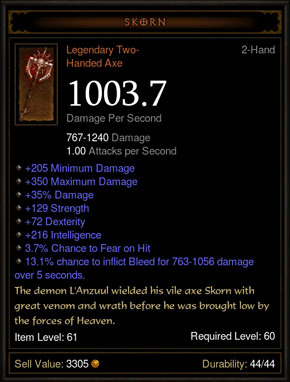 As another way to get players into using the legendary items is that they have substantially increased weapon damage, but most of all, we now have item boosts’. When I say boosts I mean extras to the weapons, such as summon an angle or demon on hit. Now doesn’t that sound cool! A few of them I have found are, the summoning of an angle or demon, fire chains with a demon, being shielded when enemies hit, charm enemies on hit, burn the ground as you walk, and lastly but not least huge skill buffs from the legendary items such as, 55% damage increase from the barbarians weapon throw and 56% from the barbarians ancient spear. Other classes also get damage percentage boosts, and all these boosts have a chance on hit, it’s not always definite (unless it’s the percentages ones). Nearly all the above stats either come from new items or you have to reroll for new ones. If you have the Blacksmith plan for a legendary then there is no need to get a new one, it will spit out these new buffs. This being said and it was a big mystery as well, set items are also classed under this ‘Legendary item buff’ and so the same rules apply! 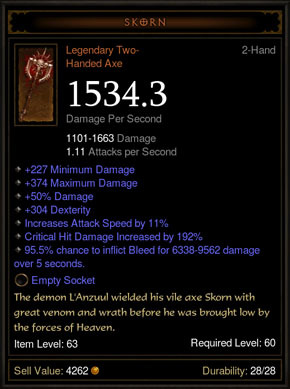 Also new set item names are being made, as well as new names for new legendary items. May I also say that any previous legendary/set items you have before this update will not get updated. The stats will stay the same, although if you still have not identified the item yet, WAIT. Because then this will apply to them. Also some items will be upgraded from item level 61 to item level 62’s and 63’s. Also, not all the legendary items are changing, in Blizzards mind some of them are already very good such as Helm of Command. They believe upgrading this would make it too over powered compared to other items. The two images below show an example of changed that might happen.